More than anyone else in Congress, Rep. Omar knows the horrific results of extremism and violence given her personal experience as a child survivor of the Somali civil war. Not only is her life in danger, she has seen where this kind of dehumanizing rhetoric, and framing of an entire people as the enemy, can lead: not only individual vigilante violence, but war and genocide. 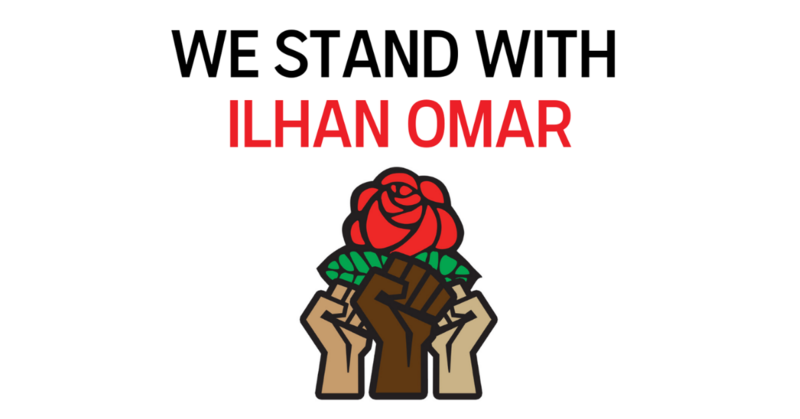 DSA is proud to stand in solidarity with Rep. Ilhan Omar, one of the bravest voices currently in Congress defending democracy and fighting for policies like Medicare for All. We join all people of conscience, regardless of their political beliefs, in rejecting it in the strongest possible terms. April 15 Politico coverage of solidarity letter. 2/13/2019 DSA Statement in solidarity about backlash to her remarks against AIPAC.